If you like to know about the fauna of Darjeeling district and that of Bengal, don't miss out on the Bengal Natural History Museum. It started as a modest effort way back in 1903 when the then Governor of Bengal initiated creation of a small museum in the Botanical Gardens of Darjeeling. A small building in the Botanical Garden was constructed at a cost of Rupees 14,000 to display only the butterflies and birds of the area. However it was too small and not good enough for the students and researchers to study the whole bird and animal life in the region. Therefore a new building near Chowrasta was constructed in 1915 at a cost of Rupees 55,000 to satisfy such requirement. 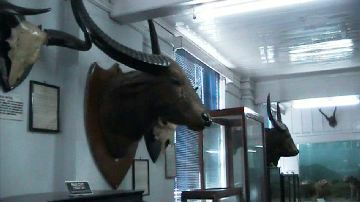 In 1923, Bengal Natural Museum Society was formed that took charge of the management of the museum. It continued until 1976 after which the management was taken over by the Forest Department of the state of West Bengal. During the initial days of the museum, an amateur ornithologist Charles M Inlis was the Curator of the museum. He held the post for 26 years since 1923. During his time, he had put in immense effort and built up the museum with active support from many officials including E.O. Shebbeare, The Conservator of Forest (Bengal), G.E. Shaw, The Superintendent of Cinchona Plantation, and many others. Today the museum houses huge collection and specimens that include wide varieties of birds with nests and eggs, reptiles and fishes, mammals, insects and more. All these specimens are of real creatures that were captured and preserved. There is a special taxidermy unit in the museum which specializes in curing, staffing and rendering the birds and animals for display on the glass cabinets. This unit has been there right from the inception of the museum. 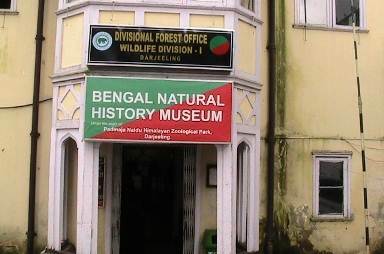 Update May 2018: Recently the Bengal Natural History Museum has been moved from its earlier location (which was only few minutes walk from the town center at Chowrasta and in the premises of Wildlife Division-I of Darjeeling) to a new constructed building at the compound where Darjeeling Zoo is located along with Himalayan Mountaineering Institute. So now with a combined entry ticket you can visit three attractions together. The description below corresponds to the building where the museum was earlier hosted. However the collections and exhibits are the same in the new venue as well. There are two large sections of the museum. One at the ground level and the other at the basement. As you enter the large room at the ground level, there are rows of glass cabinets on both sides. The first section is that of birds. You will see specimens like Himalayan Brown Wood Owls, Northern spotted owlet, Northern Brown Fish Owl, pheasants, fly catchers, woodpeckers and lot more. They are all placed in natural settings on the tree branches. 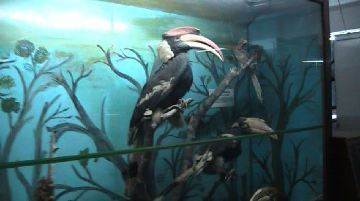 Some of the birds displayed are really huge in size and it's unlikely that you would have seen such sizes before. There are over 820 specimens of birds belonging to more than 400 species of the area. There are only two foreign species that have been given as gifts to the museum. On one side you will notice large collections of birds' eggs. There are actually 110 species of eggs, but all are not displayed due to lack of space. There is nice collection of nests of various sizes. Straight ahead in the main room is a gigantic crocodile. The species is called Estuarine which is supposed to be one of the fierce predators. It's kept in a low flat glass cabinet. There are 35 out of 76 species of snakes in the area that are displayed in the museum. There are many other specimens of reptiles and amphibians in the museum. And out of fishes in the area, you can see 57 species out of 100. As you move around the ground floor room, you will see different kinds of animals on display. Tibetan fox, Tibetan Lynx that looks like a large cat, Toddy cat, heads of wild buffaloes hanging from the walls, panthers or leopards are some of the great displays. You will also notice two huge elephant's ivory placed side by side in a circular fashion just behind the crocodile. There is a section here dedicated for the insects. There are various types of butterflies, moths, dragonflies and beetles that are displayed on glass cabinets. You can actually see 608 different species of butterflies and moths, and 1104 types of other insects here. The basement has been renovated in 2002. It has many types of birds like pelicans, jungle fowls and others against various land features of West Bengal. As you go down the stairs and enter the room, you feel as if you are in a natural green environment within trees and birds. The landscapes shown here are divided into various sections. The section 'F' represents moist deciduous forest growing in the lower hills of North Bengal, Section 'D' shows the Wet Lands, 'C' is fertile Gangetic plains of the state, 'B' is for dry areas of the state with its natural vegetation, 'A' shows the Eco system of Sundarbans area and its vegetation. There is also a small library in the Museum building. It has many rare and valuable books including 125 volume series of "The fauna of British India". There is also a reading room here. Skins of Monitor Lizard, Royal Bengal Tiger, Snow Leopard, Otter, Common Leopard, Asiatic Black Bear, Sambar, Spotted Deer, Himalayan Palm Civet, Martin, Yak, Goral, Leopard Cat, Flying Squirrel, etc. Preserved birds such as Mynas , Night Jar, Thrush, Warblers, Flycatchers ,Kingfisher, Snipe, Wood Peckers, Birds of Prey, Swifts, Niltava, Water Birds, Barbets, Hornbills, Cuckoos, Parrots & Parakeets, Owls , Minivets, Fantails, Chats, Robin , Buntings, Sunbirds , Broadbills , Finches, Nutcrackers, Suthora, Jay, Weaver Birds, Munia, Sparrows, Swallows, Shrikes, Leothrix, Cutia, Barbing, Bablers, Larks, Vulture, Bustards, etc. Many butterflies such as Lime Butterfly, Western Courtier, Autumn Leaf, Blue Admiral, Plain Tiger, Blue Bottle, Red Helen, Paris Peacock etc. Fishes like Katla, Bagha, Chega, Pabda, Singhi, Magur, Tangra, Katla, etc. And several other animals and creatures like Green Turtle Star Fish, Giant Leech, Indian Salamander etc. The museum is open 9am to 5pm daily during tourist season. It remains closed on National Holidays. You need to purchase a combined ticket of Himalayan Mountaineering Institute, Darjeeling Zoo and Bengal Natural History Museum. The combined ticket price is Rs. 60/- per person. 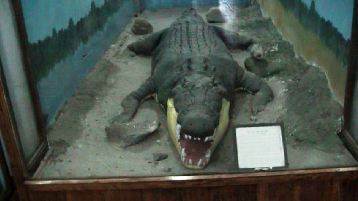 Bengal Natural History Museum is located at a place known as Jawahar Parbat in Darjeeling. You can walk from Chowrasta (along Mall road and then on Jawahar road) to reach in about 30 minutes. Alternatively take a taxi which will drop you just below the compound on Lebong Road (it's 2-3 minute uphill walk from there to the entry gate). Cars can park along Lebong Road. NOTE: Earlier the musum building was about 10 minutes walk from the Chowrasta Mall and located behind the Gorkha Ranga Manch Bhawan. The approach was from the Robertson Road. Check out Darjeeling Map to see the location of the Museum.